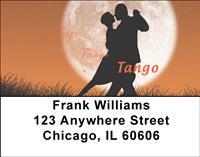 With influences from both Africa and Europe, the tango is one of Argentina's most beloved exports. A sensual dance that's full of passion and spirit, it's a favorite amongst the Latin styles and one that many people enjoy. Easily identifiable from the passionate poses and timing, if your heart is full of this lively style then you'll love this finely illustrated check series.